Jane Addams and all of us at Peachtree invite you to #BeDangerous and enter our Dangerous Jane Sweepstakes*! Jane’s passion for promoting peace and helping those in need, and her persistence and determination despite criticism, resonates in our communities now more than ever, and we want to hear the stories of all those who are carrying on Jane's activism work in their own communities. Learn more about Jane Addams here. 1. Make sure that you've followed us on Twitter, or liked our page on Facebook. 2. Reply and re-tweet our tweets, or reply with a comment on Facebook to the questions we will be posting daily from August 14th to August 25th (including weekends). We’ll be asking different questions each day about civic engagement, literacy, and social justice. 3. Every reply & re-tweet or comment counts as an entry. Feel free to respond to any and all questions we ask, but you don’t have to respond to all of them to win. The more questions you tweet or comment about, the more entries you have in our sweepstakes! 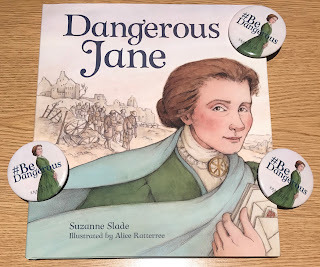 A brand new copy of Dangerous Jane and several #BeDangerous buttons! Let us know on Twitter and Facebook starting August 14th! Read about how bookstore Little Shop of Stories is engaging the community in a guest post written by co-owner Diane Capriola here! *No purchase necessary to enter or win. Open only to legal residents of the 50 United States and Washington, D.C. who are 18 years of age or older as of date of entry. Sweepstakes will begin August 14th, 2017 and end August 25th, 2017 at 11:59pm EST. One winner will be selected randomly to receive the prize. Winners will be notified by August 30th, 2017. Void where prohibited.